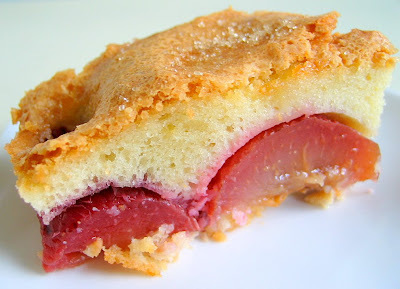 I was in a dilemma whether to put up this post after having tasted this Plum Cake. Initially I was so pleased with the look of this cake when it was taken out from the oven. I was so eager to share the recipe that I actually started typing it out while the cake was cooling off. 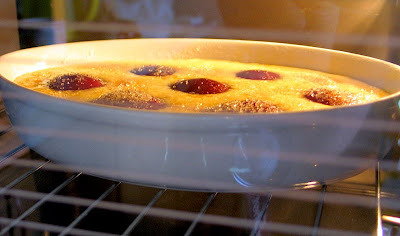 I really like the nice golden crust rising above the sunken plums, and it looked lovely in this ovenproof dish. Lately, I have been buying fresh plums whenever I passed by the fruit stalls. I am not a fan of plums, until I came across this variety...they are slightly oval in shape, and look very much like huge prunes. They are much sweeter than the usual plums and the skin is less tart. It was later on when I dropped by the supermart that I realised they are known as Sierra Prunes. 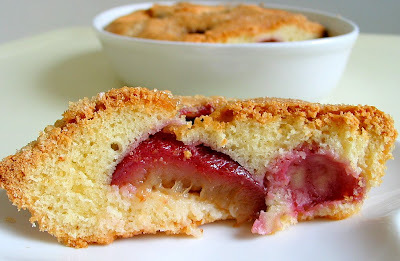 I have came across a few nice plum cake recipes posted by bloggers, but when I saw this apricot cake recipe from this book, Easy as Cake, I thought it is too simple a cake to give it a miss, although I was totally clueless how the cake will turn out, and I have never tasted a plum cake before. And I do believe it is a much healthier choice as only a small amount of oil is used with no butter added. This photo was taken on the day that the cake was baked. I read that some plum cakes will be firm and crumbly when first baked, after leaving it overnight, the texture will become softer. True enough, when I had a slice the next morning, the crust was no longer crisp, and the cake was softer and moist. Here's the photo of the cake that was left overnight on the table. Sad to say, all of us didn't like it at all...and the plums were a great disappointment, they became rather soggy and tasteless! Naturally, I was left with more than half of the cake. Luckily, I didn't make the full amount of the recipe...otherwise I would have a big problem! I kept the rest of the cake in the fridge and almost wanted to give up posting this recipe. It was only the following day, when I took out the cake to try to finish whatever I could, that I discovered that it actually tasted much better when chilled. In fact, the plums wasn't that soggy, and I even found the taste refreshing?! It was this twist that I decided I should still proceed with this post, at least just for record purpose! Preheat oven to 180 deg C, lightly grease and line a 11¾ x 9¼ x 1½ inch pan with parchment paper. In a mixing bowl, with a manual whisk, whisk eggs and sugar until sugar almost dissolved. Add in vanilla extract and oil, mix well. 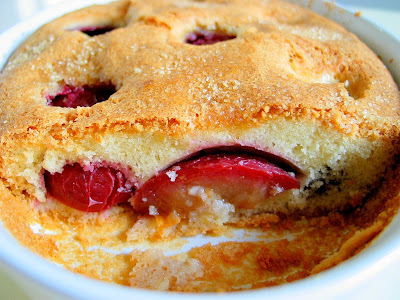 Pour batter into the prepared pan and arrange the plums cut side down, on top of the batter. Sprinkle with brown sugar and bake for 45 mins, or until golden brown. wow...you've been baking a storm HBB! all lovely posts, i'm in the same boat packing lunch boxes for my son, though he eats raw veggies. sorry to hear that your plum cake didn't turn out so good. like you, I too dump (still eatable) food in the fridge n discover, they do taste different n better. Good tip - when in doubt, throw it in the fridge and try it later. If all else fails, lots of whipped cream! Very pretty, he seems delicious! I know this is an older post, but I feel the same way about plums. 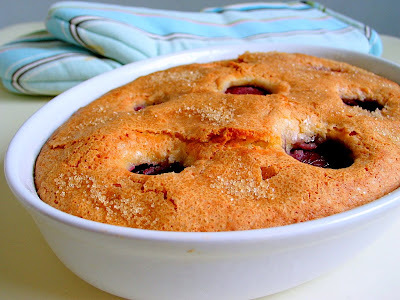 I made a plum flognarde, which I think is quite similar to this recipe but less crisp (the crispiness looks very nice). I agree that after cooking the plums had little flavour, which was very disappointing. I blamed it on the fact that the plums were from Washington and I live in Ontario... maybe plums are only good if they're grown locally. Hi Eric, oh really, you faced the same problem? All the fruits we have here are imported...so it gives me good reasons to blame it on the fruits whenever my bakes didnt turn out well. yeah, this cake recipe was great, and i didnt really have that problem, i baked mine in a tin, since that is all i have in this evil (for bakers) place! even with the mental oven, it still worked very nicely, i had customers coming back for seconds! thanks heaps! I have a plum tree overhanging the bottom of my garden and wanted to try plum cake after harvesting the fruit. Yours is the third site I have looked at and your honest appraisal makes more me confident of trying the recipe. What I really wanted to say was that the second site I visited recommended storing the cake in the fridge if it wasn't eaten the same day. It also recommended eating it hot with ice cream.